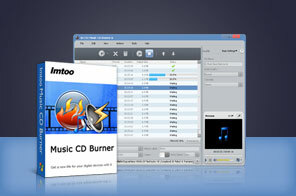 ImTOO Music CD Burner supports burning music CD from any popular audio and video format files including AVI, MPEG, WMV, MP4, FLV, MKV, H.264/MPEG-4 AVC, AVCHD, MP3, WMA, WAV, AAC, FLAC, OGG, APE and many others, enabling you to play any video and audio files on CD players. And you can also create MP3 CD or WMA CD from all supported media files. The audio parameters including audio codec, sample rate, channels and volume are adjustable, you can also set CD volume freely. Download the Audio CD Burner software now to burn CD from any music videos and music for playback on your CD players. Burn music CD from audio files of different formats including MP3, WMA, WAV, AAC, FLAC, OGG, APE and many others. Decode high-definition and standard-definition video formats and burn them into music CD. The music CD burner also allows you to create MP3 CD and WMA CD. Make the music CD burner auto-exit the application, shut down, hibernate, stand by system, or do nothing after burning to avoid waiting till the CD burning is complete. The interface is available in English, German, Spanish, French, Japanese and Chinese languages. Extract and convert audio from CD to MP3, WMA, WAV, AAC, FLAC, OGG, APE and other formats.